Please consider making a financial contribution to our committee. We accept one-time and recurring donations. You become a member of our Sustainer Society by making a recurring contribution and will receive a special lapel pin when you do. 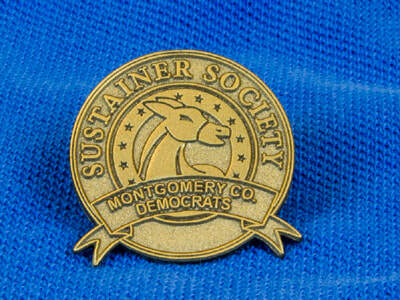 By making a recurring contribution to support the operations of the Montgomery County Democratic Committee, MCDC Sustainers are the backbone of our organization. Contributions go to support for our candidates, and to fixed costs such as office space rental and office supplies. ​We accept donations online through ActBlue. ActBlue helps many Democratic campaigns nationwide raise money. To join the Sustainer Society, click "GIVE NOW" below, and on the ActBlue page, click the checkbox labeled "Make this a monthly recurring contribution". Thank you! Our strong preference is for donations through ActBlue. While it is true that giving via credit card incurs some fees that giving by check does not, ActBlue's fees are minimal and they help us keep our reporting simple. Checks save us a small amount of money but require more paperwork and bookkeeping. I deeply believe - and not just as a matter of politics, but even as a matter of morality - that matters about reproduction and intimacy and relationships and contraception are in the personal realm. They're moral decisions for individuals to make for themselves. And the last thing we need is government intruding into those personal decisions.